There is a DJ in Shochu Lounge (Friday and Saturday) from 20:00 playing lounge music/tunes. 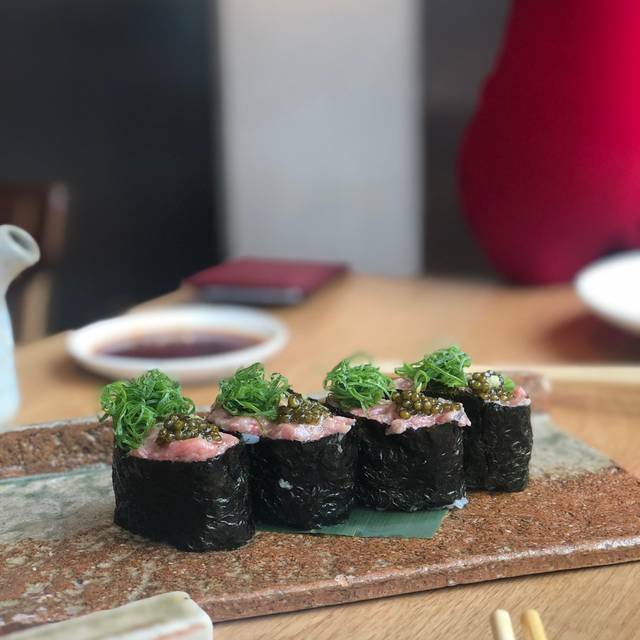 ROKA Charlotte Street serves contemporary japanese robatayaki cuisine in striking yet informal surrounding in the heart of London’s media district. 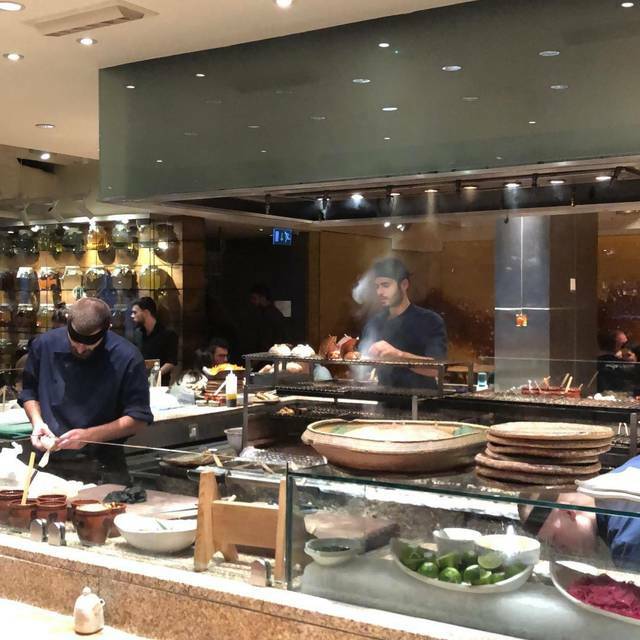 Dominated by the centrally located robata grill, fish, poultry, meat and vegetables are prepared in full view of diners at the surrounding counter and tables. In warm weather the glass walls open onto the street outside creating a semi-alfresco ambience throughout. During summer, outside tables are available for dining. The Shochu Lounge is the bar and lounge area beneath ROKA charlotte street. The award winning Shochu takes its name from Japan’s other national drink - Shochu. Known for serving traditional and contemporary cocktails as well as homemade tonics in this intimate basement lounge bar where guests can also enjoy ROKA dishes from the kitchen. Please note that from Monday to Sunday the Shochu Lounge is only open for dinner service. Shochu lounge operates an over 21 years old policy. Food and service was great, recommend the tasting menu, a must for sushi lovers! Very clean and inviting look. Top floor looks a little “clinical” and cold but downstairs is very warm and romantic. Service is quick, friendly and always with a smile. Food was and drinks range is varied and should allow for everyone’s taste. Tables are rather tight to get into and out off. Intimate setting, cherry blossoms were beautiful, food was amazing and excellent service. 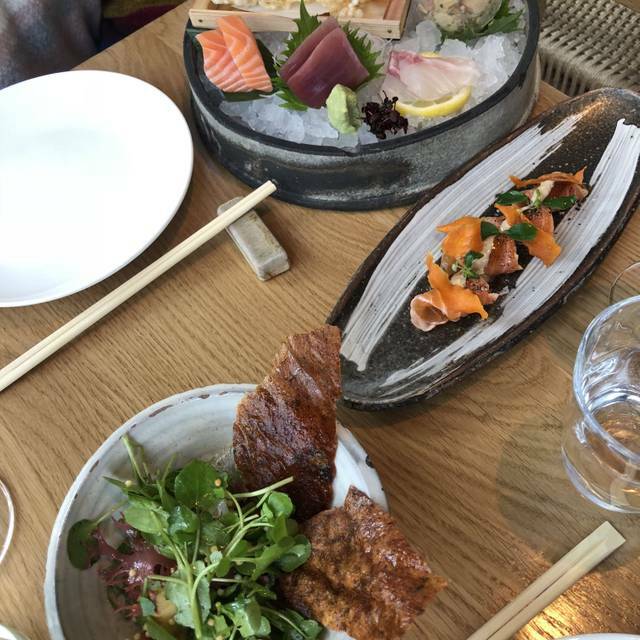 Roka is one of favourite places in London. The food is always excellent with top quality, fresh ingredients and delicious, creative flavours. The service is efficient and friendly. It has a buzzy atmosphere. Food was absolutely amazing & service was incredible! It was alright. But nothing to write home about. Better Sushi elsewhere (including other ROKA's). Fantastic food, great location and enjoyable ambiance. 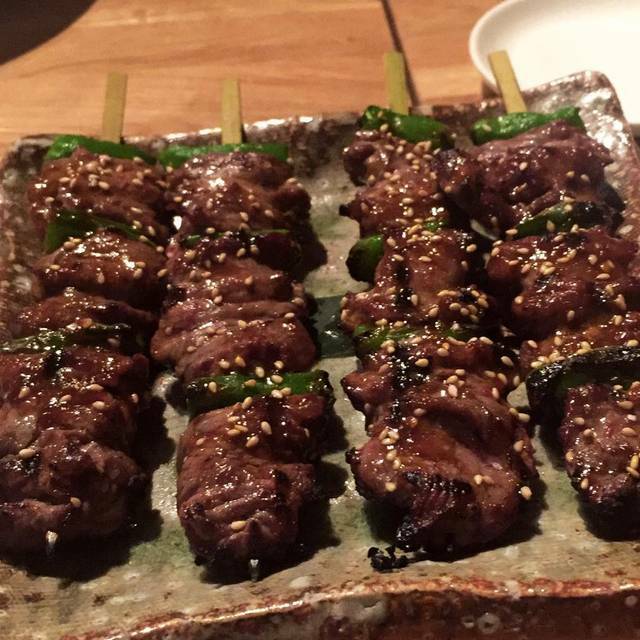 We had the taster menu with the supplemental wagyu beef and everything was delicious. I have to say, I thoroughly recommend the supplemental! Their wine selection is brilliant. The desert was a combination of exotic fruit with sweets that was just excellent. The meal is well balanced, tastes were all unique and presentation was very nice. Makes you feel you are having a special meal. They are very good at catering to allergies and food restrictions substituting dishes for delicious alternatives. It was my wife and my birthday celebration and the nice touch of a champagne glass was much appreciated. When you finish a meal like this you ask yourself what could have been better ... the answer is very little, so whatever comes next is just purely constructive and by no means intended as a criticism ... at some points the flow of information between waiters required some improvement, this resulted in a dish being brought to us and then taken away and then brought to us again ... when a meal is almost flawless you notice these things! Amazing service from beginning to the end. I was slightly early and was shown the bar downstairs, the bar man was friendly and kept me company as my date was late. Always the place! Been here numerous times. The team has changed though but the food was good. The sake list was better this round, highly recommend. The buzz still there but the booking system should be more flexible. We have been for the second time and think the food is exceptionally good. Premiym Tasting menu was amazing. The full table was pleased. We will certainly come back. The semi-fatty tuna melted like butter in my mouth. The cod & crab dumplings were delicious, as was the lamb and the scallops. The desert platter had something for everyone. THANKS. Never fails to impress. Their lamb chops are phenomenal. It’s pricy but worth it. You get what you pay for in my view. My wife and I were looking forward to a taster menu. Our seating options were on a two seat table on the main thoroughfare or at the bar where Chef Mickey Mouse and his entourage yell at the top of their voice whenever there is an order of broccoli or something more costly. The food looked and smelt awesome, but the concept is great for 10 year olds who are happy to play with their phones and not talk with anybody else at their table. Horses for courses... and even if there were horses there, you couldn't hear them. Amazing food. Great service. Good vibe to the restaurant. Pricey but worth it. Great food, with attentive service. We really enjoyed our time there. Amazing food and fantastic service, very buzzy atmosphere (it was Friday night) so it was rather noisy, tables are quite close together, I'd go again early in the week when it might be a bit quieter. Always great. The food is consistently good and the ambience is wonderful. Management is great and accommodating. I find the table service somewhat condescending at time. I can understand them trying to be helpful but when you've been going there longer than they have worked there, it seems that their lack of knowledge can be testing. Small issue for such a great restaurant. 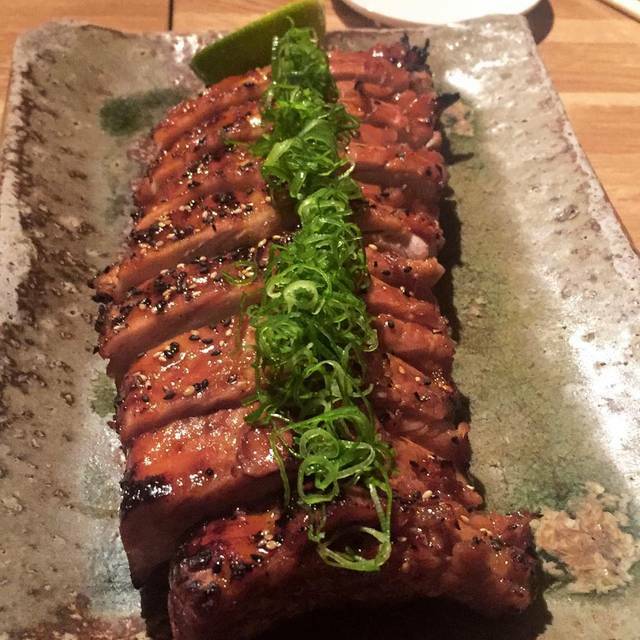 As always, we had a great time at ROKA Charlotte Street. Our server, Peter, was very helpful and made us feel very welcome. Cheers! We were excited about having the Vegan set menu only to find it is not currently being offered. We ate from the À la cart menu and our hope is that they bring back a Vegan set menu. Excellent sake. Over seasoned meat and grilled salmon, too salty and too sweet. Fresh fish and seafood. Good ambient and excellent service. It was a relaxed and totally enjoyable occasion. Great restaurant / venue for a special occassion, food and service is fantastic. I booked this restaurant for my friend’s birthday and unfortunately I was quite underwhelmed by the experience. I found the servers to be extremely attentive and not in a good way. I wasn’t sure if they wanted to rush us out or what but it got to the point where it was uncomfortable, and this was from the very beginning. To her credit she did apologise and offered us a drinks tasting sample in the bar downstairs. As for the food although it was good, the portions were not adequate for a sharing dining experience. I left still hungry and I felt that we paid quite a lot for quite small portions. I would have preferred an a la carte option. I will not come back here again I’m afraid. Don’t come here if you are hungry. Big disappointment , was there a few years ago and loved it so we were looking forward our meal! The one pot meal “rice” was so gooey, like gelatin, the broccoli was horrible. The makis were fresh and tasty. We were helped by so many different people, could barely have a conversation! I would not recommend this restaurant ! Great food and service was 5*. Was s great way to end the day shopping !! We took our 2yr old there , who in truth was quite badly behaved , but the staff were brilliant. Constantly picking up whatever he threw on the floor, which in the case of the Wagyu beef was hard to watch. They even washed his little cutlery set before we left ! The adults, better behaved I might add, had a superb lunch. Still one off my favourite restaurants and has been for the last 10 years. Great restaurant, can be noisy inside. Excellent service & food. Presentation & slelctoon of cuisine was brilliant. Bar seating around the chefs is worth doing, but make sure you’re not by the door! We sat the other side and it was much better. Visited earlier in the week for an anniversary lunch - great service from the start. Promptly seated with choice of table. The servers were very relaxed with no pressure on anything. We ordered a cocktail and warm appetiser of spicy edamame - cocktail was superbly crafted and the starter was lovely. We ordered a bunch of sashimi, maki and dumplings for the next course - all tastefully presented and delicious. 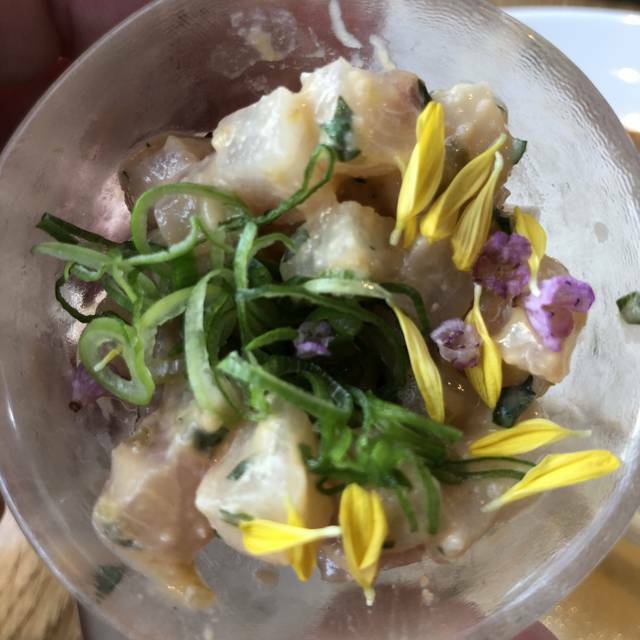 I took away one star because one of my crab and cod dumplings had pieces of crab shell in it. Obviously it was unpleasant biting into it - not a big deal but also not expected at such a great restaurant. Had a wonderful evening at Roka in Charlotte Street. Very busy location, but the table service was not compromised. Menu was superb and had a great range of choices. Our waitress was very knowledgeable about the menu and gave some great recommendations. One thing to me tin, the fruit platter was overpriced for the amount of fruit on there. Only drawback was the coat check out. Very inefficient system, especially when the restaurant is so busy. Clear communication always helps. Our coats were downstairs but no one mentioned this. We just had long wait, with no idea why. I love food at Roka. It’s always incredible. You are never disappointed with any of the choices which makes trying something new very appealing because you know you’ll love it.